MaestroMarine LLC is staffed by naval architects and marine engineers with an extensive background in many types of design, engineering, and analysis projects. 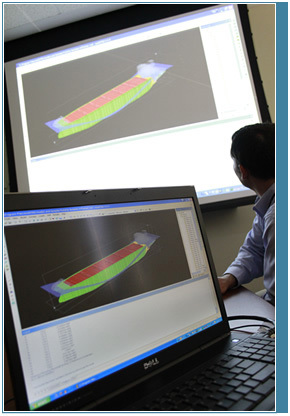 Over the years, our staff has carried out countless ship design and analysis projects, using advanced computer-aided design/engineering (CAD/CAE) tools and naval architecture fundamentals to solve a range of problems in an efficient and cost-effective manner for our customers. MaestroMarine LLC works with clients throughout the design process covering hull form design, ship structures, resistance and powering analysis, stability calculations, hydrodynamic predictions, as well as seakeeping and maneuvering analyses. Structural design and analysis services provided by MaestroMarine LLC can include creating conceptual designs, functional level drawings, and detailed production level drawings in accordance with industry and government regulatory standards. This activity includes using fundamental structural engineering principles as well as finite element based methods, such as MAESTRO and Nastran. Using internally developed and commercially available design tools, our naval architects can conduct resistance and powering, stability, hydrodynamic, and seakeeping and maneuvering analyses with great proficiency and accuracy. Our naval architects are also software developers and employ modern software development practices. These agile development methodologies, such as those found in the Unified Process (UP) and eXtreme Programing, produce high quality software quickly, adapt easily to changes in customer requirements, and allow the customer to stay involved as the software project matures. Why not hire our structural engineers to do an analysis for you?